I found some great advice in the strangest of places. 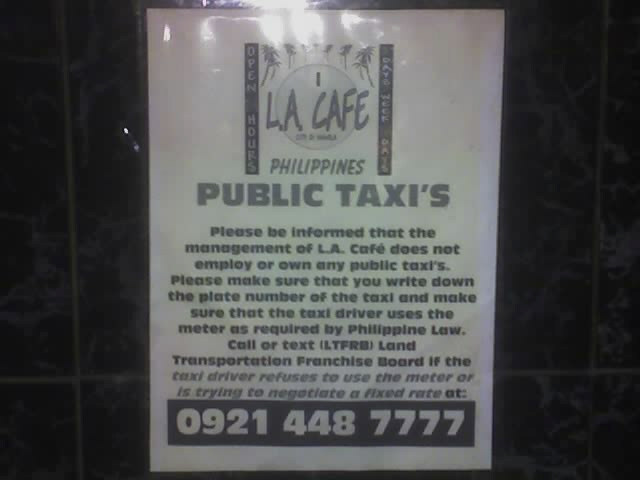 This is in the toilet of the LA Cafe in Manila, Philippines. A true cultural experience of the Philippines and funny as can be. Report a Taxi that will not use the Meter. I now open my cell phone, ready to photograph. I get in the taxi, say meter. If I hear a headache, I get out of the taxi, take a photo and send to this. Plus I am putting on my page. I took this photos with my Motorola Cell phone. Note, I recommend anyone wanting to purchase land in the Philippines to enter one of the local BARS... and talk with Expats for a couple of hours, it will save you more money than imaginable. Places like the LA Cafe are their offices.